When Erik Farrell ran away from home, he had no idea what he was getting himself into! Imprisoned by the Groundlings, he makes a harrowing escape with the aid of an unlikely ally. But … will Erik’s new found freedom come with a price? 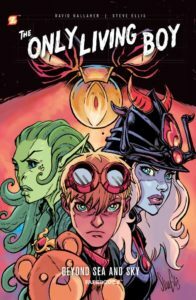 Nominated for a Harvey Award as one of the year’s best books for younger readers, David Gallaher and Steve Ellis re-unite with a new action-packed volume of The Only Living Boy that will thrill both the young and the young at heart! Originally starting out as a webcomic, The Only Living Boy has grown in popularity and scope. 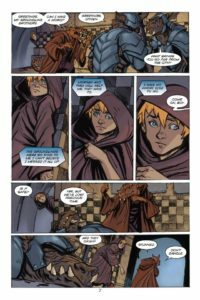 Now it’s available in paperback and hardcover, as well as digitally from sources like ComiXology, and the story itself is moving along at a pretty brisk clip. 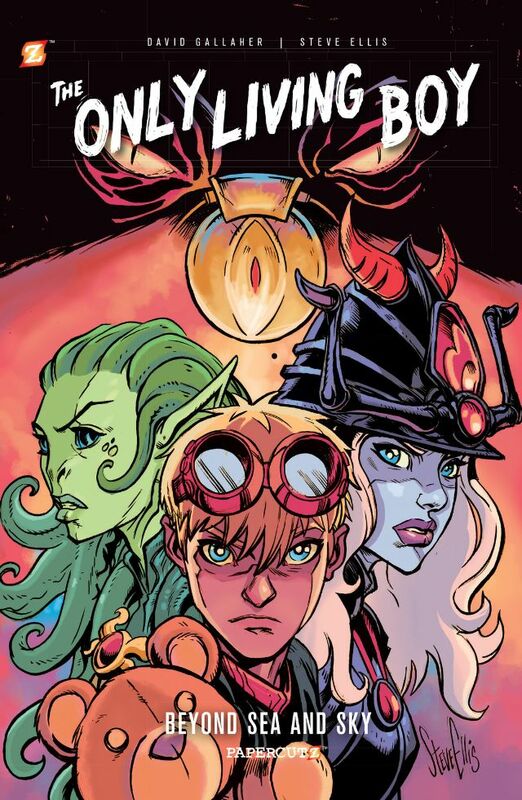 Twelve year old Erik Farrell, the titular Only Living Boy to be found on the patchwork planet of Chimerika, continues his chaotic journey in search of his lost memories and a place where he feels like he belongs. Along the way, he’s met up with the Sectaurian princess Thea, the arrogant Mermidonian warrior Morgan, and a host of other strange beings who have alternately helped and hunted him. In volume one (see that review right over here), Erik ran away from home, fell asleep in the park and woke up on a crazy world populated by some pretty crazy “people”, was captured and escaped from the sinister Dr. Once, and found himself determined to take control of his life for the first time in his life. We had a glimpse into Erik’s life prior to running away, and by all appearances it was no picnic. Then, finding himself on the world of Chimerika, with no idea of how he got there and only broken memories of his past life, Erik was tossed around like a tiny playing piece on a gi-hugic gameboard. In volume two, Erik’s situation hasn’t really improved. He’s the prisoner of the subterranean Groundlings, gifted mapmakers who are convinced that Erik led the minions of Dr. Once to their hidden underground city. 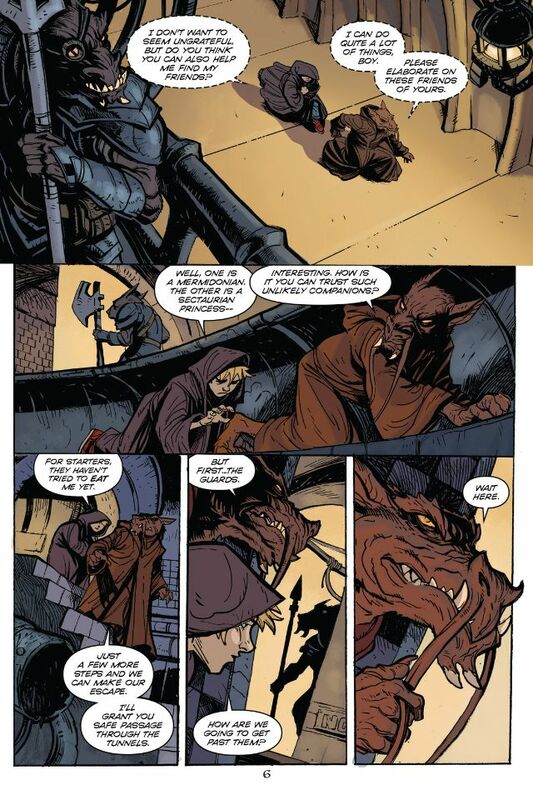 With the help of a mysterious ally, Erik escapes before he’s executed for his perceived crimes. Now in a borrowed/stolen underwater ship, Erik is once again on the run, heading toward the Mermidonian stronghold, where he’ll be reunited with his new friends Mermidonian warrior Morgan and Sectaurian princess Thea. Still being pushed and pulled, directed by outside forces with no say in his own fate, Erik struggles to take control of his life. To do that, he’s decided that he can’t be afraid anymore, to act instead of being acted upon, and to defend his new friends come hell or high water. Erik’s final stop in this episode of his ongoing story is the hive city of Sectuarius, Thea’s home. There, he finds the next step in his journey… for better or for worse, because if everything was roses and bunny rabbits this would be a very boring story. 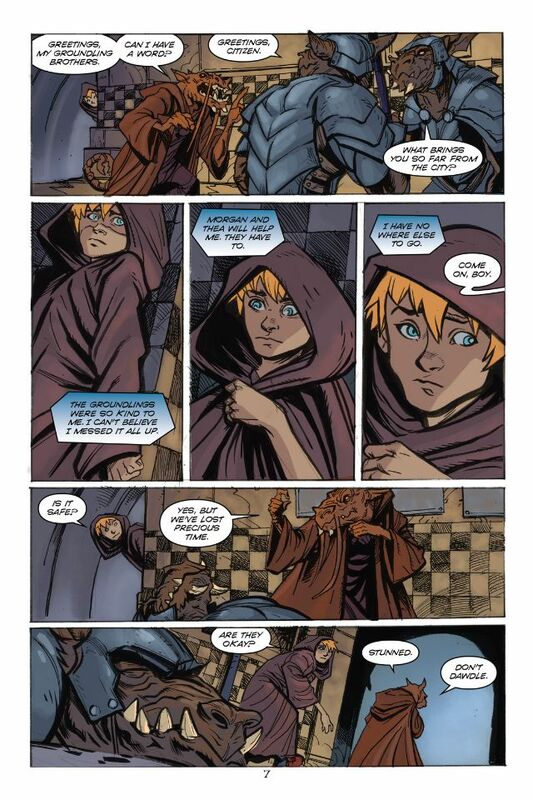 Gallaher and Ellis have crafted a pretty intense story, set in a deeply layered world. While it is written for ages young and up, it should be no means be mistaken for a simple two dimensional tale. First off, we still haven’t figured out what or where this patchwork world of Chimerika is. It could be our own world’s future, broken and pieced back together into a haphazard patchwork planet. It might even be an alternate dimension, where multiple realities have collided, blending together in an uneven new reality with no rhyme or reason. 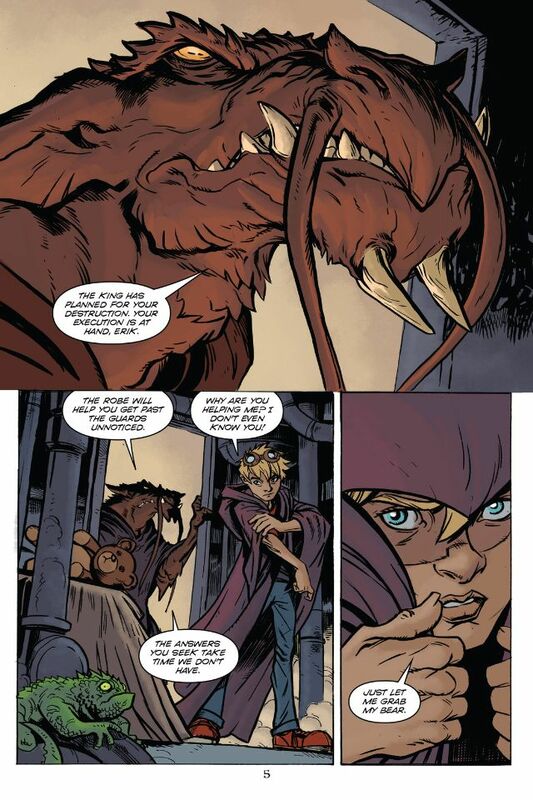 Even more interesting (or troubling), it might all be a figment of Erik’s traumatized imagination, a possibility that rears its ugly head periodically throughout the narrative, where Erik sees or hears brief flashes of that other world he used to call “home”. However it all turns out, and I will be paying attention because this is great stuff, Erik is going to have to come to terms with some unpleasant truths. His past might not have been all that great, but he’s not going to get anywhere in his current situation until he can figure out how it all comes together. If you have kids, and you’re looking for some cool reading time material, this is a great option: it isn’t too high on the violence-o-meter, the language is perfectly fine for younguns, and the story manages to dig into more complicated themes to keep the adults interested. Where was this when I was stuck reading Clifford the Big Red Dog over and over and over (… and over)?